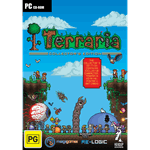 Digging, fighting, exploring, building - in this action-adventure game Terraria nothing is impossible. Grab your tools and go! You can do many things in Terraria: make weapons and fight off a variety of enemies in numerous biomes, dig deep underground to find accessories, money, and other useful things, gather wood, stone, ores, and other resources to create everything you need to make the world your own and defend it. Build a house, a fort, even a castle and people will move in to live there and perhaps even sell you different wares to assist you on your journey. But beware, there are even more challenges awaiting you... Are you up to the task?